Will I benefit from either a hair transplant or medication? It is my experience that all patients can potentially benefit from hair transplantation. However some patients will benefit more than others. Age is an important factor to consider, as this corresponds to the current level of hair-loss. It’s arguably the most significant factor in the projection of future hair-loss and whether or not medication or surgery might be the best and most appropriate modality of treatment. While patients who undergo a transplant will have permanent transplanted hair, it is still very important to remember that transplantation will not alter the natural physiology of your hair or your specific genetic pattern. Native hair (that is, the non-transplanted hair) will have a continued tendency to fall out over time. At Paradigm, we will look at a future plan for projected hair-loss and this might include, for some patients, the use of medication, post surgery, as a means of supporting the life expectancy of the non-transplanted hair. In essence, medication can be used to resuscitate the dying hairs (aka miniaturising hairs) while surgery is used to fill in the areas where hair-loss has already occurred. Is the hair transplant permanent? The transplanted hairs that are moved are indeed permanent. (Further information on the scientific details about this are included in a later section on the technical details of transplantation) The hairs that are extracted and then replanted are what I call ‘privileged’ hair. That means they are not prone to hair-loss and thus, will not fall out. However, the native hairs that exist in the part of the head that is thinning will continue to fall out. It is important for patients to have an on-going relationship with the clinic. Hair-loss can be managed over a period of time, making adjustments as the pattern of hair-loss continues, replacing lost hair with ‘privileged’ transplanted hair in a subtle process which can transform the path that your hair-loss would otherwise appear to take. Some patients elect to take medication to prolong the life of the native hair. Others are comfortable with the thought that if they wish to have increased density in the future then they can plan for subsequent transplants with Paradigm. All of these factors can be discussed in consultation and a treatment plan drawn-up. This will be a flexible and collaborative plan which will take account of future patterns of individual hair-loss. If I have a transplant do I have to have another one in the future? The simple answer is no. For some patients, one transplant will be adequate. If the patient only wants to have one transplant, then the design team can work to ensure the coverage and density of the hair in the particularly problematic areas of concern. These areas of concern will vary from patient to patient. Each patient will have a unique constellation of concerns about their hair-loss and the consultation process at Paradigm will take careful consideration of these unique issues. It will generally be the case, however, that if only one surgery is required, that surgery will be rather larger to account for future hair-loss. A sufficient number of grafts will be needed for an optimal outcome. A staged approach can be easily managed with the FUE technique which naturally lends itself to this process. What are the principles of a hair transplant procedure? 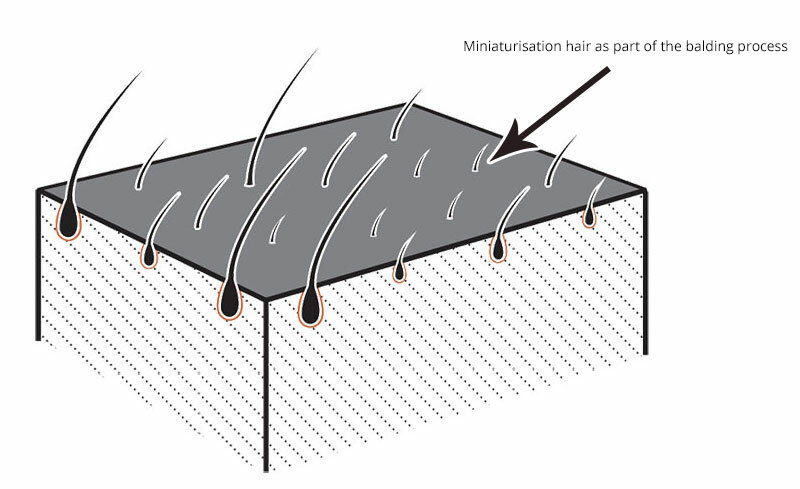 The fundamental principle of the hair transplantation process is that of taking the “privileged” hairs from the back of the scalp and relocating these hairs to wherever thinning is occurring. Generally speaking, these areas will be on the crown of the head, and/or at the front where a hair-line can be reconstructed by our skilled surgical design team. This process is complicated by such factors as the thickness of the ‘privileged’ hair, the directions in which each hair naturally grows and various other attributes of the hair. These concerns all demand a level of technical skill and experience to ensure the best quality of transplant. Is there visible scarring left behind? Scarring is naturally a concern for most patients. They will wish to avoid conspicuousness when the hair is wet, when they are at the hairdressers or when they have to have a close, short cut e.g. if they work/holiday in a hot environment. As a consultant plastic surgeon, I have a great deal of experience in this area. Modern technology and micro surgery mean that I can use microscopic cylindrical extraction blades to remove an individual hair follicle - or indeed part of a hair follicle. This is carried out at a very high magnification level thus leaving a very, very small hole where the hair once was. Any circular hole then contracts to form an even smaller ‘scar’. As there are naturally pale areas of scalp between scalp hair, it is not visible to others even with a very short hair cut. In many cases, one is able to shave the head completely and see no scarring at all. This is in contrast to the earlier strip method of hair removal which can indeed leave a visible scar by virtue of the continuous uninterrupted nature of the scar. In addition FUE techniques, in my hands, are the most effective method of treating and disguising visible scarring that has arisen from a previous strip transplant technique. What type of hair transplant procedures does Mr Fogarty perform? Will others know that I have had a transplant? A number of key things make this extremely unlikely. Our grafts are not recognisable as grafts, even on close inspection. In patients who have surgery before they go significantly bald, they will have their own hair - and this will be added to and augmented by the surgery. The Paradigm process is an innovation in hair transplantation in that it can be done gradually, in a bespoke fashion and there will be an on-going relationship with the patient. This process also makes it very unlikely that there will be a point at which people can notice that a hair transplantation has happened. It will effect a subtle change, over time, and, for this reason, will be undetectable. What if I have any post-operative problems? Mr Fogarty and his team will be available to provide all necessary after-care in the event of any possible post surgical complications. They will also be available to address any patient anxieties or concerns should this be needed. What type of post-operative complications can occur? As with all surgical procedures, there are some small potential risks involved. These will be considered throughly during the consultation process and the therapeutic effects of any treatment will always be weighed carefully with the possible complications. Who carries out the surgery and where does the surgery take place? Mr Brendan Fogarty, an NHS consultant plastic surgeon will carry out the surgery from his clinic in Belfast. No. At the very worst, there may be some minor discomfort whilst the skin is being frozen with a local anaesthetic - but Paradigm are experts in pain management and great care is taken to ensure pain-free surgery. Following surgery, because it is an FUE procedure, there are no stitches in the skin and thus no tension on the skin. Importantly, there are no sutures to be removed. What type of anaesthesia is needed? Local anaesthesia. Oral sedation is usually used which contributes to a pleasant patient experience. This depends on the size of the surgery, but usually between four to eight hours. I am worried that people will know that I have had the surgery? Working in such a sensitive area, Mr Fogarty is keenly aware of patient discretion and this is of paramount priority. The surgery itself is carried out in a discrete location in Belfast, away from the main thoroughfares so no-one will know when you enter and leave our clinic. It is important to point out, that when patients opt for a single surgery, the hair at the back of the scalp may need to be shaved for the procedure itself. Hair grows back to a number one blade length within two to three weeks. Thus, for a number of weeks or months before the procedure is undertaken, patients can adopt a tight hair cut. This ensures that after the procedure people will not notice a difference because of hair length or style. These factors and issues can be discussed during the consultation process. How much time away from work will I require? For the first few days after the surgery there can be some bruising at the front of the scalp, and, for this reason, some patients may choose to take several days off work. But, in general, the primary limitation and return to work is largely a social discretion. As the procedure is pain-free and there are no stitches to remove, patients will be physically able to do everything they normally do the day following surgery. Vigorous exercise would not be recommended for approximately a 2 week period afterwards. Do I have to shave my head? This depends on patient preference and the number of grafts required. For a smaller number of grafts (eg less than 600), a non-shaven head technique can be used. For a larger number of grafts, a shaven back of head technique is preferable. Patients can opt to have several smaller surgeries over a period of time if they are concerned about having to shave their heads. When will I start to see hair growth? While the root of the hair follicle will survive, the hair shaft, that is, the visible element on the surface of the skin WILL fall out approximately three weeks after surgery. But the important part of the transplant remains, beneath the surface of the skin, growing to form the new hair. The patient should see the beginnings of new follicle hair growth around six months after surgery. Crucially, the hair grows back gradually, as opposed to all at once. This gradual re-growth over time allows for the naturalisation of appearance and is one of the main reasons why your hair transplantation will not be noticed by others. Many patients report that people observe they look younger, thinner or even happier - but they do not appreciate why this change has actually happened!